4.5 out of 5 based on 95 bloggers and 22 commenters. 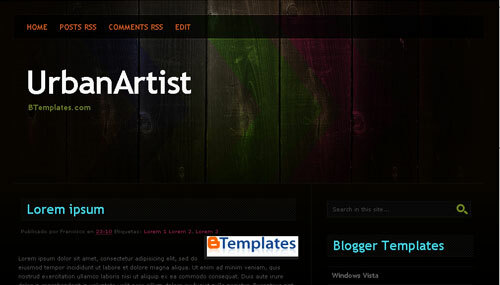 UrbanArtist is a free premium blogger template with 2 columns and right sidebar. Excellent template for blogs about art, business or culture. Thanks for a great template. I use firefox exclusively…and wish others would too. It looks great in firefox..but loads wrong in IE7. How can this be fixed? how ca i change the background of my blogger?? The background images do not show up when used. What can be done to correct this? Thanks so much for this template, it’s perfect for what I’m trying to create… new to blogging, but the template seems to be functioning great and serving my purposes so far! I do have one question, I’d like to remove the “home, posts, comments and edit” tabs along the top. How can I do this? Any help would be hugely appreciated. I apreciate your help, and thank you. great. can i have the embed or html code? I just downloaded this layout (it’s gorgeous, by the way). I’m just wondering if you could tell me how to edit the EDIT button at the top. Does anyone have the image files for the template? I would like to host on my own image host as the linked to image host goes down repetedly. About the above question you can contact me through my blog or just replay here. thanks so much. Really hope I get these files as I love the template and it looks great with my content. Just a hassle when it cant go out to fetch the images in a dependable way. Posso chiedere un consiglio? Ho la necessità di cambiare colore ai link esci e iscriviti per email (sono di colore blu) che si trovano rispettivamente a lato, il primo, e un pochino più sotto, il secondo, a commenta come:. Dopo tanti tentativi fatti nel blog di prova ancora non ci sono riuscito. Mi è venuto un dubbio, sono forse link a riposo? Sono di questo colore perché stò lavorando nel blog di prova? Solamente una volta, non ricordo dove, modificando i colori, la scritta esci è cambiata da blu a viola. Sto cambiando totalmente la veste grafica del mio blog,premetto che sono alle prime armi, ma il fatto di modificare e soprattutto di apprendere come è formato un template mi affascina molto. Nonostante tutto … Stò inpazzendo!!! Potete darmi una mano? Questo template è veramente bello,ed è perfetto per pubblicare le mie foto. hola.. les agradeceria q el q pueda informarme como seria posible hacer que en la entrada principal solo me aparescan unas pocas imagenes, cuando son demasiadas y q solo sean visibles todas cuando se ingrese a la entrada…..
por favor, es q asi se ve muy dejado el blog. hi i just liked ur template very much. u have placed a default menu in this template.